Even in our contemporary, mostly urban, not so agrarian age, as distanced as we’ve become from nature and its rhythms, still, we have a pretty good understanding of the seasons. We know about solstices, we know about equinoxes, we know when spring has come and summer, fall, and winter. But we have, in general, lost touch with some handy units of measure: the cross quarter days. The cross quarter days mark the approximate halfway point between solstice and equinox. If we think of the year as a clock, and if we place the December solstice at 12 and the June solstice at 6, and if we place the March equinox at 3 and the September equinox at 9… well, we can divide things a little further and place the four cross quarter days at 1:30, 4:30, 7:30, and 10:30. Traditionally, the cross quarter days are marked by holydays/holidays. The one we most recently celebrated was at the end of October and start of November: Halloween, All Saints Day, and All Souls Day––the Days of the Dead. We were approaching winter; life was descending below the earth. As February begins, we reach the next period of cross quarter days, marked by St. Brigid’s Day on the 1st and on the 2nd, Candlemas and Groundhog Day. This period marks the first stirrings of earth’s awakening on the approach to spring. Winter still has a firm grip, to be sure (it was 28 below zero at my aunt’s house in Illinois just last night)… but one thing to keep in mind with these traditional ways of reckoning time is they are always a small step ahead of the game. In this reckoning, the equinox in March will mark the height of spring… and so spring’s beginnings start here, as January melts into February. St. Brigid, sacred to Ireland and second in stature there only to St. Patrick, is honored on the First of the month. In the older earthbound religions, the day honors the Celtic goddess Brigid and brings the season of Imbolc. As the goddess goes, the old crone of winter is reborn now as the young maiden, for this is a time of renewal. The seeds that were planted beneath the earth last fall are preparing to bring forth lush green life, once spring truly arrives. If you’ve been holding on to Christmas, this is the time to let it go. In some traditions, tonight marks the end of the Christmas season. Indeed, it is considered bad luck to have any remnants of Christmas greenery in the house beyond Candlemas Eve, which also comes this first night of February. Candlemas is the day that candles are blessed in the church, but it is also known as Purification Day, which harkens back to an old Hebrew tradition: forty days after the birth of a son, women would go to the temple to be purified. Again, renewal. And so Mary did this, for it was her tradition, and when she did, it was there at the temple that she and her infant child ran into the elders Simeon and Anna, who recognized the child as “the Light of the World.” Spring may be coming as we find ourselves forty days past midwinter, but the darkness of those darkest nights still closely lingers, and that light is still a powerful metaphor. One of my favorite Candlemas traditions is to go through the house at sunset, lighting every lamp, even for just a few minutes. Follow that with a meal of crepes (a European Candlemas tradition) or tamales and hot chocolate (the tradition in Mexico). One of the finest songs for this day and for those who follow these ways is an old carol called “Jesus, the Light of the World.” Candlemas is an old weather marker, too. As the old saying goes: If the sun shines bright on Candlemas day / The half of the winter’s not yet away. And while Candlemas itself is not paid much attention these days here in the States, this remnant of the day remains in our tradition of Groundhog Day. The photo above is of St. Brigid’s Well at Cullion, County Westmeath, in Ireland. The cross above the name is a St. Brigid’s Cross, and it is traditional on her day to fashion crosses in this shape from reeds. Photograph by Laineylee [2015, Creative Commons, via Wikimedia Commons]. No matter what happens in our lives––times of sadness, times of joy––our planet continues to do what it does: spin on its axis and orbit the sun. These are the celestial mechanics of a universe ruled by gravity. The spinning causes our passing days and nights and the orbiting, our seasons, and today, thanks to that constant progression around the sun, we find ourselves just about midway between the midwinter solstice of December and the spring equinox of March. As a halfway point in the seasonal round it is known as a cross-quarter day, one that in Celtic tradition is called Imbolc: the start, in traditional reckoning of time, of spring in the Northern Hemisphere. The Church gave the day to St. Brigid, or St. Brigit, but me, I like the Brigid version because it looks more like “bridge,” which is what Brigid does: she bridges us from one perspective to the next, from winter to spring’s first stirrings. It will, for sure, be a long while before winter loses its grip, but Brigid gives us the assurance that it will happen, for nothing stays the same in the Earth’s daily migration along its path. Winter will give way to spring, spring to summer, summer to autumn, autumn to winter, winter to spring again. “The only thing that stays the same is change,” say the Waterboys in an old song of theirs, and they are right. It is traditional for St. Brigid’s Day to fashion a St. Brigid’s Cross out of rushes or reeds (this is what you see in today’s photograph, above), as well as to leave an oat cake and butter on a windowsill in your home. This, to encourage Brigid to visit your home and bless all who live there. Brigid bridges us also to Candlemas, which comes tomorrow, and tonight, being Candlemas Eve, marks the true and official end of the Christmas season. If there still remain vestiges of yuletide greenery in your home, this is the night to remove them. And so tonight return to nature what is hers––the rosemary, bays, mistletoe, holly, ivy, all––if for no other reason than that soon enough, the earth itself will once again be erupting in green. 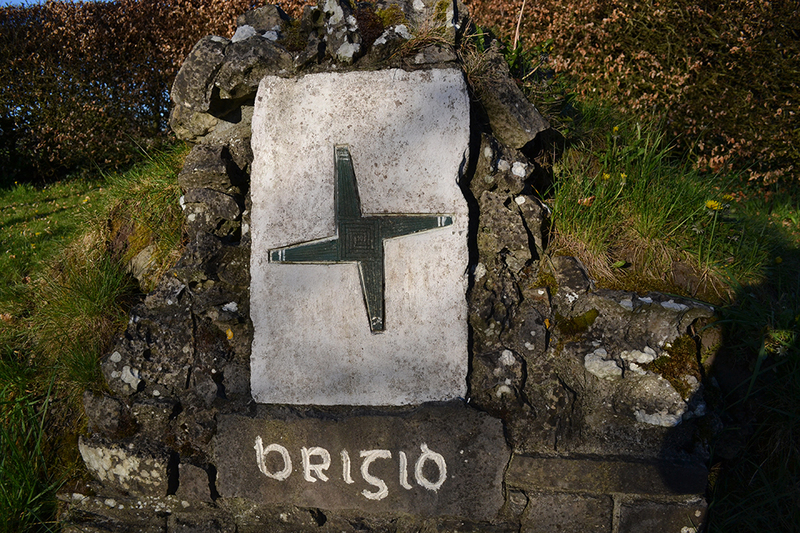 Image: St. Brigid’s Cross by Liscannorman [Creative Commons], via Wikimedia Commons. Perhaps you heard the National Public Radio story not long ago about Ittoqqortoormiit, a small town in Greenland, experiencing its first sunrise in 58 days. That was on January 20th and daylight there that day, after 58 days of continuous darkness, lasted for 1 hour, 5 minutes and 20 seconds. Here we are today at the First of February, and already daylight in Ittoqqortoormiit has increased to nearly 4 hours and 35 minutes. That’s a pretty dramatic shift in 12 days, but this is life at the Arctic Circle: a bit more extreme than the temperate world. What is tremendously apparent in Ittoqqortoormiit these days is that winter is waning: spring is on its way. Most of us do not live in the Arctic Circle, however, and as we head further south toward the equator, the shift in hours of daylight and the shift toward spring is less apparent and less dramatic. But rest assured it is happening. The Earth continues to shift in its seat and the wheel of the year remains in constant motion. Today, the First of February, we reach another spoke in that wheel: we are now about halfway between the Midwinter Solstice of December and the Spring Equinox of March, and tonight brings Imbolc, a holiday of the Celtic calendar. The red letter days that mark this time are varied and fascinating. There is Candlemas tomorrow, and also Groundhog Day. Of the two, most Americans are at least familiar with the latter, while Candlemas is one that many have never heard of. There is an old, old tradition that has Christmastime ending at Candlemas, and for those who follow these old ways, Candlemas is the day that the Christmas greenery must come down. To have the Yuletide decorations up longer than Candlemas is to risk bringing bad luck upon the home. But Candlemas and Groundhog Day are tomorrow. Now it is Imbolc––the start of spring by traditional reckoning of time in the Northern Hemisphere––and it is St. Brigid’s Day. 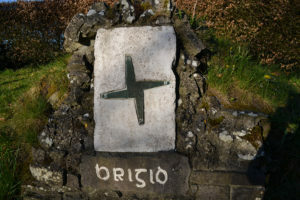 Both are sacred to Ireland: Imbolc goes back to the country’s Celtic roots, and St. Brigid’s Day is second in stature in Ireland only to St. Patrick’s Day. At this cross quarter day, this midpoint between solstice and equinox, we are at the very start of springtime. It’s a bit perplexing and yet highly sensible when you sit and ponder it, and perhaps it helps if we think of the spring season and compare it to one lunar cycle. At this halfway point between solstice and equinox, you might think of this start of spring as the time of the new moon, a faint sliver of moon emerging out of the dark of night. Reaching the equinox in March is like the full moon… the height of spring. And as we head past the equinox and toward the next cross quarter day in May (Beltane), with spring drawing to a close and passing away to summer, it is like the waning moon. All of these things we celebrate these two days are related. Imbolc is the old celebration of the return of spring. With Imbolc, the earth goddess, ever changing, shifts once again from the old crone of winter to the young maiden of spring. The word is derived from the Gaelic oimelc (ewe’s milk) for as the milk begins to flow for newborn lambs at this time of year, so soon will frozen streams and rivers begin to melt and flow, and so soon will green––and warmth––return. The Church early on christianized the goddess and gave the day to St. Brigid (or Brigit, your choice, though Brigid, with its Celtic pronunciation (brigg-id or bree-id) is more proper). Brigid, a bridge from winter to spring. The night of St. Brigid’s Day brings Candlemas Eve. Candlemas is the day of blessing candles in the Church, forty days past Christmas. It is also known as Purification Day, which comes out of an old Jewish tradition: forty days after the birth of a son, mothers would go to the temple to be purified. And so the story goes that forty days after the birth of Jesus, Mary went to the temple to be purified. You might think of it as renewal. Which brings us back again to the renewal of the goddess and Imbolc. As for Groundhog Day, it is just one of many traditions that come out of Candlemas as a day for forecasting the weather. In our home, Candlemas will be the day we ceremoniously haul out the Christmas tree. We don’t typically leave it up this long, but our tree this year has been so beautiful, and it has been drinking water all this time, and Haden the Convivio Shop Cat has loved sleeping under it and running under its lower branches. The tree has, in its way, been instructing us to follow the old ways and so this year we have. Tomorrow night, though, we will bring it out and set it in its quiet corner of the garden where it will sit and rest until next winter solstice, when it will fuel our fire to once again drive the cold winter away and bring light to the darkness. Therein lies some powerful magic. But now, light is returning. 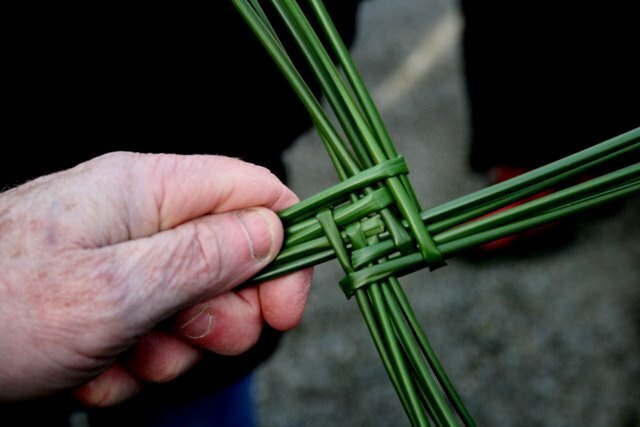 It is traditional for St. Brigid’s Day to fashion a St. Brigid’s Cross out of rushes or reeds, as well as to leave an oat cake and butter on a windowsill in your home. This, to encourage Brigid to visit your home and bless all who live there. And so we welcome Brigid, and so we welcome spring, and so we welcome back the sun, we welcome back our dear friend. 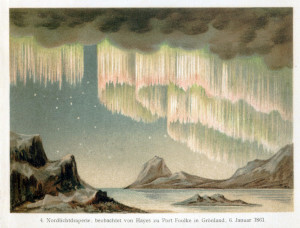 Image: Detail from “Polarlichter I,” a chromolithograph of the Northern Lights from Meyers Konversations-Lexikon, 6th ed., vol. 16, circa 1908. [Public domain] via Wikimedia Commons.